Indigenous land owners from the Marap people in Arso have used customary law to take back oil palm land owned by PT PN II as part of its Arso plantation, specifically the Core III, Core IV and Core V divisions. The action took place at Yamara village PIR 3, Manem sub-district, Keerom Regency, on Wednesday 27th April. Maickel Fatagur, the head of the Fatagur clan which holds customary land rights, alongside other clans such as the Wabiager and Gumis clans, said that they will no longer hold any kind of meetings with the company. 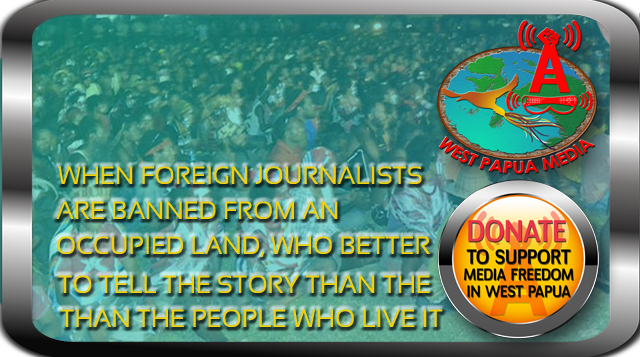 That is because they have used customary law to take back the land PTPN was using. “We’e used customary law to take the land back. That means now there will be no more meetings with the company. The land now belongs to us. We invite PTPN II Arso to take back its oil palm and we will take back our land. That’s all”, Fatagur made clear to the Manager of PTPN II’s Arso plantation on Wednesday at Tami in Manem District, in Keerom. “All these years attention has never been paid to the wellbeing of the community who hold the customary land rights on the land used by PTPN II Arso at the three locations in question, Core III, Core IV and Core V, which amount to 1300 hectares”, said Fatagur. Dominika Tafor, the secretary of the Boda Student Association (Himpunan Mahasiswa Boda) in Keerom who is also an indigenous member of the Marap ethnic group, said that she was supporting the action taken by local indigenous people. “We strongly support the action which the Marap community of Workwama village are taking today. We support it, because for so many years the company has not paid attention to the fate of the community. They only come to destroy”, she said. When the indigenous people arrived at the plantation office in Tami, PTPN II’s Arso plantation manager, Hilarius Manurung, recieved them and said that he would take their wishes on board and pass them on to the Keerom local government. “Since we’re a state owned company, we can only listen to all aspirations and complaints and pass them on to the local government for further action. There’s not much we can do. What we can do is to follow up all these complaints from the community,” said Manurung. 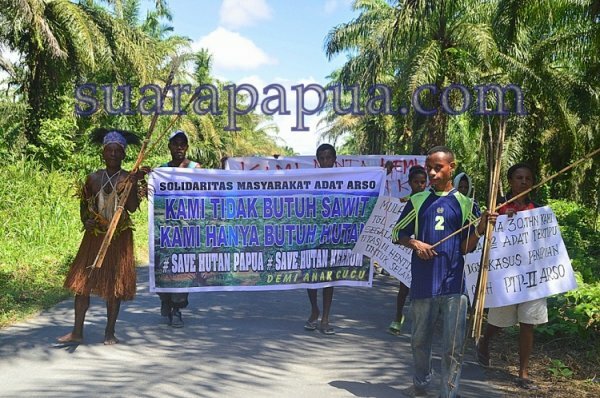 Suarapapua.com observed that security forces from the Keerom police headquarters were present, 11 armed policemen in a Dalmas truck, ready to police the Marap people’s action. As a symbol, the indigenous people brought soil from the three oil palm locations and taro yams from their gardens, placing them in a noken string bag made from forest palm frond midribs, and using traditional rituals took them to PTPN II’s office located in the plantation administration centre in Tami.